Once upon a time, miss Kristy avoided mushrooms like the plague! It was the squeak, the smell, the taste, everything! But then, Miss Kristy discovered she couldn't eat anything... well, that's an over-exaggeration - but she couldn't eat a lot - and her allergies finally pushed her to the point of no return and she decided to try mushrooms again. Turns out, Miss Kristy's tastes had changed - and she's also going to stop talking in annoying third person. But it's the truth, I hated mushrooms - but then again, I'd only ever eaten them one way. The way my Mum cooked them - sauteed in a pan with butter and then added into something else. My sister eats them raw and that skieved me out too - but I learnt how to cook them myself and found some ways that have made me fall in love with mushrooms! I eat a primarily meatless diet, not because I'm a vegetarian but because I don't like meat that much and I often have trouble finding chicken or turkey that hasn't been contaminated with gluten or had anything added to it. Recently, I've started eating more and more chicken and turkey but as I don't eat much meat, and can't eat any form of beans or legumes (due to food allergies/intolerances and IBS), I always try to make sure I'm getting enough essential vitamins and minerals (and yours truly is also intolerant to iron supplements and most vitamin supplements - seriously winning in the stomach dept :P). Mushrooms are little nutrition powerhouses! They're high in vitamin D so they're great for your bones, contain compounds (such as lectins, glucans and certain carbohydrates) which both fight and protect against cancer, are very low GI as well as have a bunch of other benefits. I've also found the ways to make them taste really really good - and which varieties are the best. 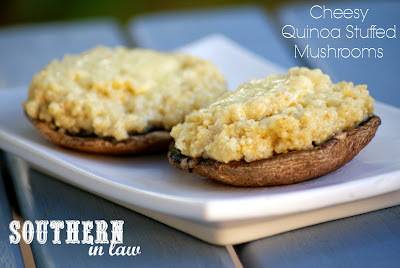 Jesse was a mushroom hater, but I've managed to change his mind thanks to portobello/portabella mushrooms - and this is one of my favourite ways to enjoy them! So let's get onto the recipe, shall we?! Preheat your oven to 180°C/355°F degrees. Mix together your cream cheese, 1 tbsp parmesan cheese, garlic, salt and pepper with your cooked quinoa in a small saucepan, adding a touch of water if needed to combine everything together. Allow your quinoa to thicken slightly and take your quinoa off the heat. Place your mushrooms onto a baking sheet or baking dish lined with baking paper, stem side down. Bake until the top of your mushrooms start to soften and wrinkle (about 10-15 minutes), flip and remove your baking sheet from the oven. 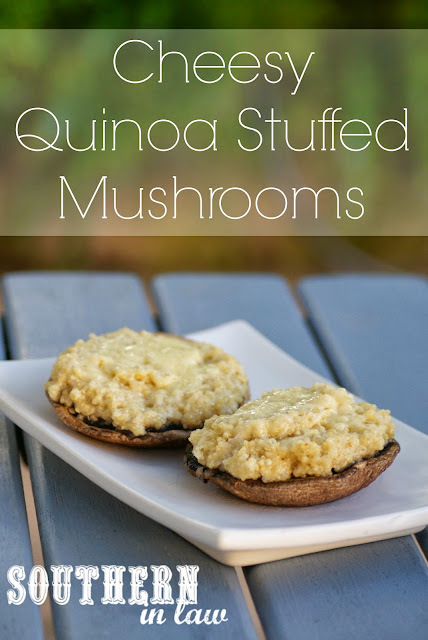 Carefully place your quinoa mix on top of your mushrooms, spreading out to cover the mushrooms to the edges. 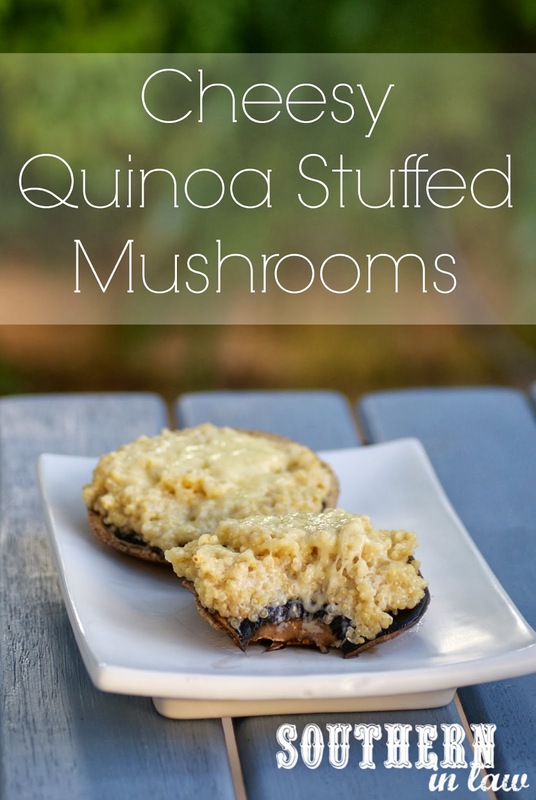 Sprinkle your remaining parmesan cheese on top of your quinoa mix and place your baking sheet with the filled mushrooms back into the oven. Bake until your cheese starts to melt and the quinoa heats up. Leave to cool slightly before serving! We serve this as a side dish (one mushroom each) with some grilled chicken and salad or enjoy it as a meal with a salad on the side. But tell me, what vegetable are you loving at the moment? And what's your favourite way to eat mushrooms? My other current veggie obsession is Purple Sweet Potatoes! They are so divine I can't even begin to express my love for them hahaha! This looks delicious. I used to dislike mushrooms too. Now, I like them! Thanks for sharing. By the way, purple sweet potatoes are delicious! I don't think there's many kids out there that like mushrooms - it must be a more mature taste! I really need to try a purple sweet potato now haha. they look delicious! great healthy recipe!